Hooray! 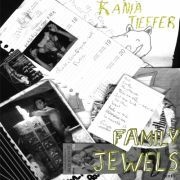 Kania Tieffer is dead… Long Live Family Jewels! Kania Tieffer does not need an introduction… she was part of several Enfant Terrible live events through out the years, and was present on the Hex Grammofoonplaten compilation (Hex#1). This EP was imagined and planned for a long time. In the end it came out as this: the last record ever by Kania Tieffer and the first record ever by the new project of the same musician, called Family Jewels. While Kania Tieffer was always crazy, twisted and trashy elektro pop, her new project Family Jewels is like a Crystal Castles zonked out of their heads on acid. So be prepared for this next attack!